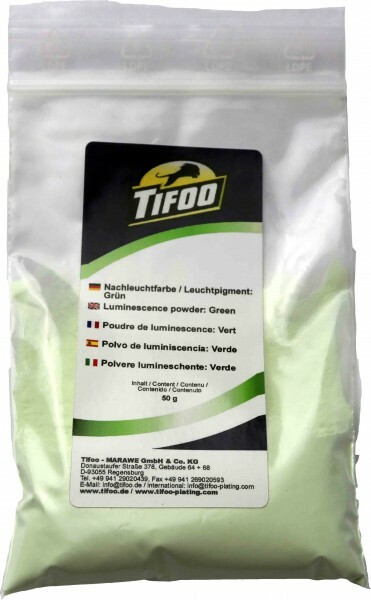 Product information "Glow in the dark powder green"
The TIFOO glow in the dark powder can be purchased in different colours, e.g. green, turquoise and blue. The turquoise luminescence powder shows the highest luminescence. Its use is extraordinary easy: just illuminate shortly and directly with sunlight or a strong lamp and after a few minutes, the powder is charged. It glows many hours in the dark. The glowing pigment can eithter be used directly as decoration article or it can be mixed e. g. into colours. We recommend especially the combination with the water-based Tifoo Clear lacquer. Related links to "Glow in the dark powder green"
Customer evaluation for "Glow in the dark powder green"